Posters advertising Holy Week (Semana Santa) processions line shop windows and tapas bar walls in southern Spain. There are shops and bars that display them from years past, lending the establishments the air of a collectibles shop. Despite Semana Santa being only once a year, many bars, restaurants, stores, and even private homes in Spain remain adorned year round with pictures from the glorious processions. One well known tapas bar in Sevilla–La Fresquita–is an institution devoted to Holy Week adoration. La Fresquita is a temple devoted to beer and Holy Week brotherhoods. There’s not an inch of empty space on the walls–the paint barely peers through. The walls are completely covered with Sevilla Holy Week pictures and memorabilia. La Fresquita in the photo below. Holy Week processions start on the Friday before Palm Sunday (Friday of Sorrows) and end on Easter Sunday. Local brotherhoods known as cofradías carry the floats bearing statues of the Virgin Mary and Jesus, narrating scenes of the passion of Christ and the sorrows of the Virgin Mary. Each brotherhood carries one Christ and one Virgin Mary, ranging from Our Lady of Peace to Jesus of the Three Falls. In the cities and towns that celebrate Semana Santa the most intensely there are many brotherhoods, and there are countless processions. Since the week is Spain’s spring break, everyone is able to participate, whether that means joining a cofradía, some of which have thousands of members, or simply by standing, or sitting, and watching the processions. The floats move impossibly through the narrow streets in the historic quarters of Andalusian cities and towns while onlookers watch their slow progress. Slow because the heavy floats are carried on the shoulders of the brotherhood members–costaleros or cargadores. 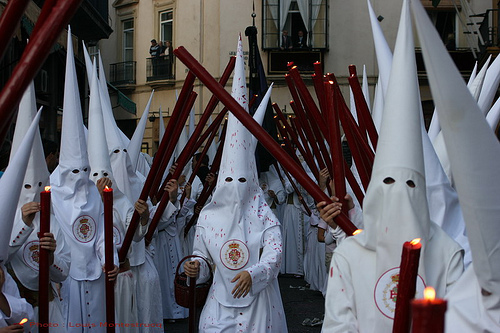 Accompanying the floats are the penitents–nazarenos–dressed in the pointed hoods and robes, sometimes white, red, blue, or even black. They are followed by marching bands playing a uniform repertoire of music with a driving drum beat and slightly unsettling wailing horns which echo across whole towns and let everyone know what is afoot. After the last procession returns to its home church on Easter, things will return to normal. People go back to work, without too much excitement until Feria (the spring fair) or summer vacation. But at La Fresquita, and for many people all over the country, Semana Santa never has to end. To see the best of Andalucía take a look at our Essential Andalucía Tour which travels to Sevilla, Ronda, Córdoba and Granada.